Lauren Staveley is taking on the world, and she is doing a fine job at it too! This young Australian girl is one to watch, at only 18 years old she is setting herself up to achieve Olympic dreams. Lauren is backed with numerous Australian and USASA junior titles and is now competing on the World Cup circuit. She started snowboarding at the age of nine and just has not stopped. Now that is a lot of time on snow! Some may say that is lucky, but I know better. Lauren has put in hours and hours of hard work and battled her way through a few injuries too, as well as completing high school at the same time! This girl is just full of awesome! Since I contacted you about this interview I hear you have broken your foot! What happened!? I was competing in a World Cup in the Czech Republic. My practice days went well and I was super excited for the contest. However on contest day during practice I took the jump a little too big and landed heavy on my right foot. It was pretty painful, but I was determined to compete. I landed my first run, but couldn't put down the second run. I went to the medical centre the next day and turns out I had broken my 5th metatarsal! But it will be healed after 4 weeks in a cast and I'll be back at it again. What does that mean for the rest of your North American season? I unfortunately can't compete in the last World Cup in Spain and I miss out on the US nationals. I am hoping to come back over to the US in May/June to get some more training in. Even with the broken foot things are looking good for you to be qualifying Australia a spot in slopestyle for the Olympics. How does it make you feel, knowing that there is a strong possibility you could be representing Australia at the Olympics!? It's pretty unbelievable at the moment. It doesn't really feel real. I am just planning on keeping my results consistent and qualify my spot. It's pretty exciting and I can't wait to find out if I’m going to the games! You have done a whole lot of traveling with snowboarding, Czech Republic, Italy, Spain, Canada (did I miss any!?) and of course New Zealand, if you could give out 2 pieces of best snowboard travel advice, what would they be? Haha! Well, I have also been to Japan. Where I learnt a vital travel tip, practice your hand gestures! Some snowboarding destinations don't speak much English so pointing and waving comes in handy. And number two is make sure all your bags have wheels! Never ever travel with a bag you have to carry. Oh, I so agree about the wheels! 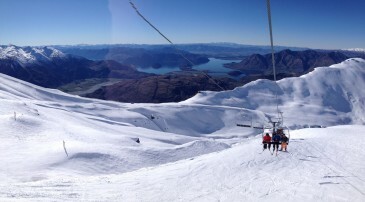 Hey also can I check, will we be seeing you on the slopes in Wanaka this winter? I will definitely be in Wanaka this year! We are hoping to get a few weeks training over in NZ leading up to the NZ Winter Games. Perfect, I am looking forward to the NZ Winter Games, they are going to be awesome! Finally one last questions, if you could ride a chair lift when anyone you choose, who would it be, why, and what would you ask him or her? I would ride a chairlift with Bethany Hamilton. She is a professional Surfer who lost her left arm in a shark attack when she was 13. I find this story so inspirational and I'd love to ask her about her journey back to surfing after the attack. Aw, nice choice! I am sure you have seen the movie Soul Surfer – a very inspirational movie about Bethany Hamilton. Thanks for your time Lauren, the crew at NZ Snow Tours wishes you a speedy metatarsal recovery and safe travels back home to Australia for some good R&R. 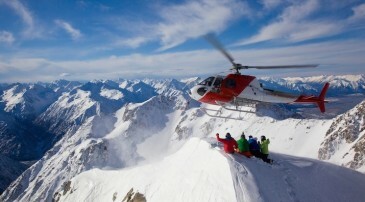 We will catch you on the slopes in Wanaka!